Tired of reaching back or using your elbow to lock the doors? Tired of leaning over to open a door for a passenger or opening your own door to unlock them? Want the ability to easily lock the doors AND trunk while you drive thus preventing unwanted entry? 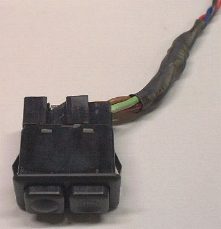 All you need is a common window switch from any 6 series, 528e, or early 7 series and some simple wiring. The switch I used was not a lighted type but thats fine. A switch that has the arrows worn off is best since otherwise the arrows would point left and right rather than up and down. Rotating the buttons in the switch is not possible unfortunately. Just remember it cannot be a latching switch - must be momentary. The rear window lockout switch cannot be used for this reason. Here is how it will look when completed. Looks original & natural. 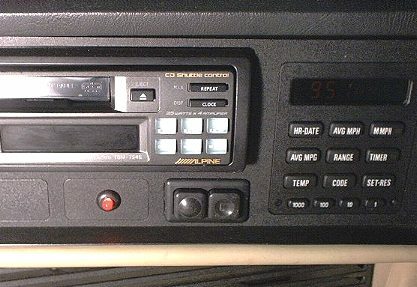 There are four horizontal plates under the radio area. On my car they were all blanking plates but many cars will have a stereo fader control and/or heated seat switches. The standard window switch is a perfect fit with no trimming etc required. I used the far right location so that both driver and passenger can reach it and its right above the shift handle making it easy to find in the dark or without looking for it. To prevent damaging the surround of the switch area, I found it best to remove the dummy plate by accessing from behind. Or, since you're removing the dummy plate anyway you can drill a small hole in it then put in a wood screw and pull the plate out. (Note: These steps outline my experience on my 89 635. I hear that an 86 model matches mine however. Open the glove box and remove the screws securing the ceiling plate of the glove box. You will have to remove the limit straps for the glove box door to remove the ceiling plate. The glove box light will have to be temporarily disconnected too. You will not have to remove the glove box door itself however. Make a new wire set of 3 different color strands of 14 gauge wire and about 2 feet long. I chose red for lock, blue for unlock and black for ground. Leave the ground wire about 6 inches longer and solder a screw tab to it. This will be screwed to the ceiling along with the lock module. 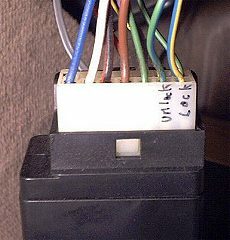 I used the original window switch socket and grafted my wires to that, ignoring the original socket wire colors. 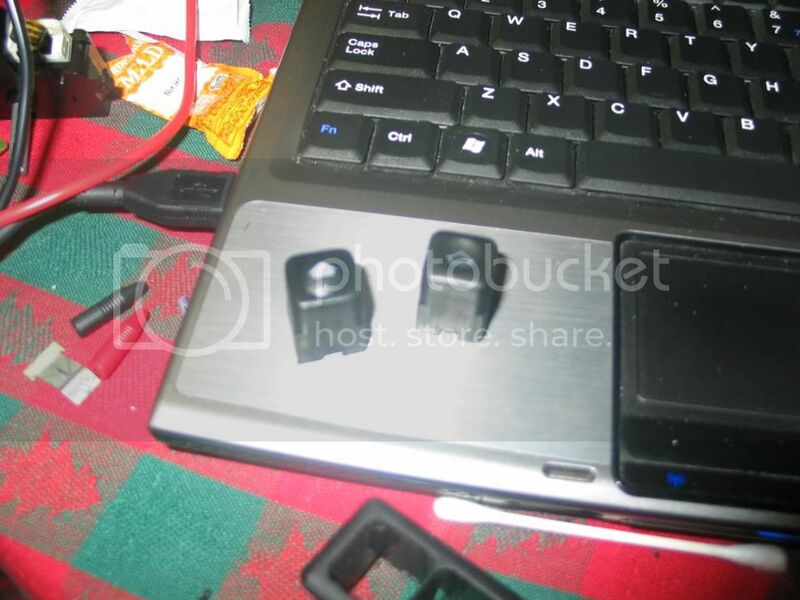 I marked with a black marker on the switch to identify the pins you will need - as shown in the photo below. From left to right: L ock , G round, U nlock. The other 2 pins are unused. Note the white plastic orientation pin. give a connection to one of the needed pins. My choice was for the indented botton to be lock while the bubble button as unlock. Just seemed like up and down to me. Solder and shrink tubing a must. Braid or twist the 3 wire set to stay neat and feed through the switch hole toward the lock module and grab from behind. The Locking module is mounted vertically to the metal ceiling bracing and to the left side rear section of the glove box. Its a black box about 5 inches long and 1x2 rectangular. 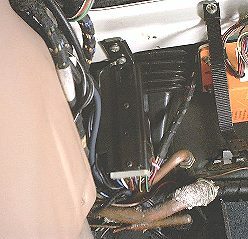 Remove the two screws holding it to the ceiling and bring the unit still plugged in toward the opening of the glove box. 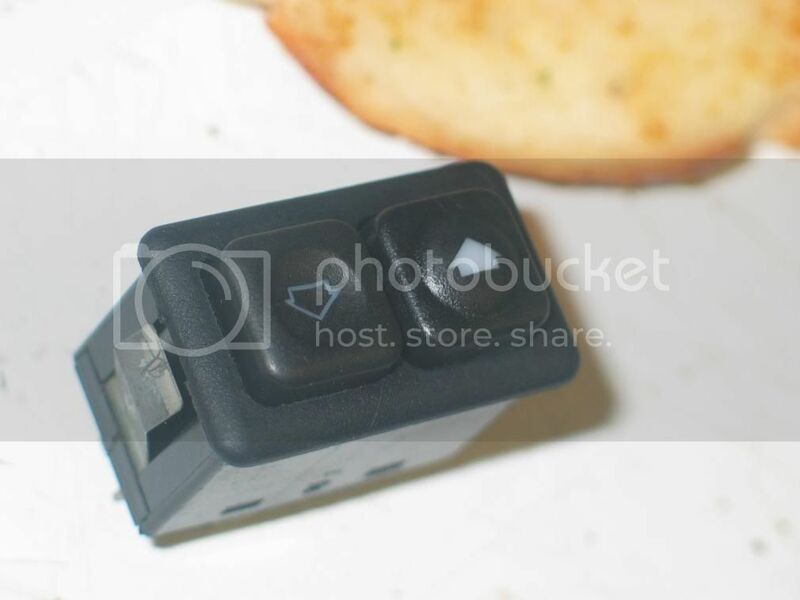 I marked on the plug which wires - as shown in the photo below. There are two rows of about 10 wires on the plug. You want access to pins #6 and 7 which for me was the yellow/blue wire and green/blue wires. The module had the pin numbers identified also. Pin 6 is unlock and 7 is lock. use a paperclip to release the wire socket and remove each wire one at a time from the plug. Remove about a 3/8" section of insulation near the end of the wire but don't cut the wire. Attach the corresponding newly made wire set to each old wire and solder. Then cover them each with shrink tubing (or electrical tape) and reinstall into the plug. Reinstall the lock module to the ceiling including one of the screws through the new ground wire. Tie everything up neatly and reinstall the glove box ceiling plate etc. If not already done so, push the new switch into position. Reinstall the fuse or reconnect the battery cable and proceed to test/use. This does not require the key for use. NOTE: I heard that over use of the module in rapid succesion will burn it out. Use it only as needed. The red LED on the left is the alarm indicator. Very useful. Sharkfan is going to do the same thing from what I hear, definitely makes sense. 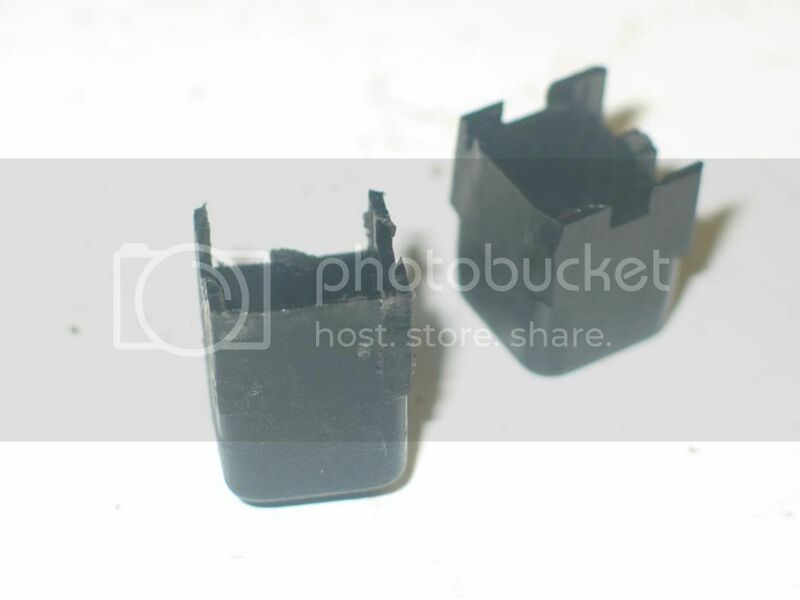 Now what about using another 'window' switch (located in another of the switch blanks) to seperately unlock the boot - which in theory, would rise up on its linkages at the press of the button? Anyone (with a wiring diagram...) got any ideas as to where to 'get into' the switching for the boot? Same unit as shown for the central locking mod? I did this fix to my '85 M6 in under an hour and encountered no problems. Top article including all the photos. I don't think Dave's suggestion of an automatic boot opener wired in the same way would work becuase the actuators only operate the locks not the handles or boot button. If you wanted to do this I think you'd need a second (more powerful ??) actuator operating the actual boot mechnism, as opposed to the lock, as at present. Incidentally, the trickiest bit for me seemed be squeezing the switch into the dash aperture, it sure was tight and at one stage I thought it wouldn't go - but it did and my spine is a lot happier. Next step is do it to my 635. I'm glad it was so straight-forward, mind you with excellent instructions & good quality photos alot of the head-aches of doing it from scratch are removed I'd guess. I've just carried out a second extra central locking switch conversion on my 635 and the only thing I'd change is do with the switch itself. The window switch is a VERY tight fit in the 4-button panel and future removal could potentially damage the button mounting plate, so the second time around I ripped off the metal springs that sit each end of the window lift button. The fit is still easily tight enough but future removal would lessen the risk of damage to the console plate. As for removing the metal springs, I didn't dare try to dis-assemble the button, just a pair of pliers, a pull and a twist and it comes cleanly away. In my experience, the lighted switch will not work. 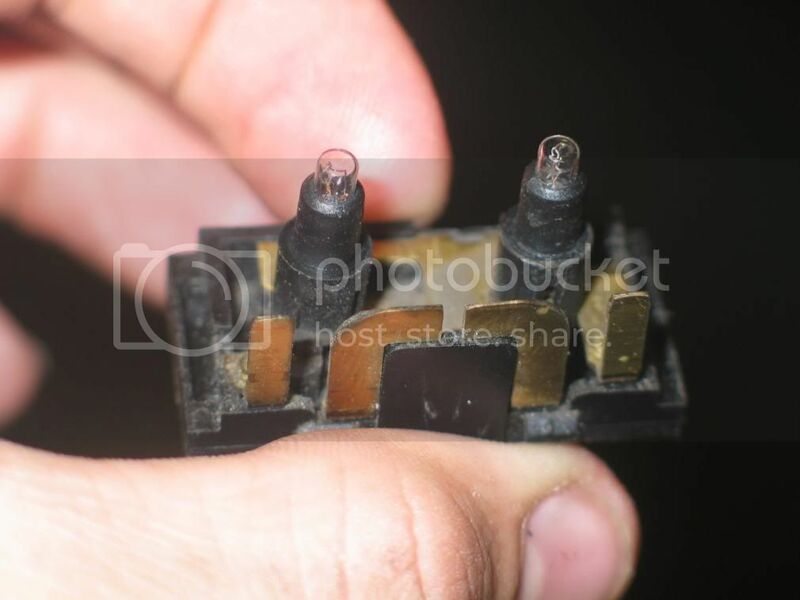 In my 1987 635CSi, the lights (apparently) close the gaps between the contacts enough to form a direct circuit between the lock and unlock contacts. I've tested it with two lighted switches, including a known-good switch from the shift console. I have yet to obtain a non-lit switch, to see if it's the lights or my 6er. Well I finally managed to get the wires out of the socket, took me hours but satisfaction is much higher having succeeded. Now to connect my newer wire set and see how it goes! You GO Aaron! These fine machines were put together by regular guys like us. There is no reason that another regular guy can't fix it, or make it better. 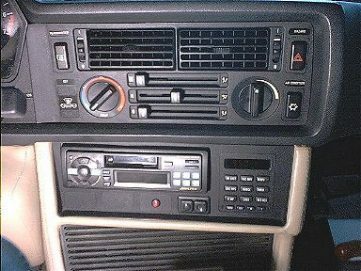 I will be attempting the same mod on a 1983 633CSi. I'm unsure of just what complications I might run into. Maybe some, maybe none. cgswift wrote: You GO Aaron! These fine machines were put together by regular guys like us. There is no reason that another regular guy can't fix it, or make it better. I will be attempting the same mod on a 1983 633CSi. I'm unsure of just what complications I might run into. Maybe some, maybe none. Dan in DC wrote: In my experience, the lighted switch will not work. Hello, I am just about to do the install of this switch... can anyone tell me if this lighted switch really deosnt work? If not, can I just open the switch and take the lights out? Or must I search for a non-lighted switch? 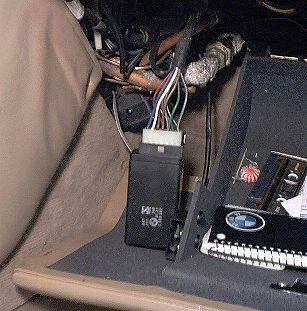 If so, which BMW models had this kind of switch and where was it located or what was it used for? yea you should type a nice guide. Your system actually functions with the illuminated switch? Others have not had such luck! Sorry, I forgot, welcome to the madness! Coupes Up! had no issues Still typing up a tech article on it what set up are you going to do? Well hell Alpine, if you make an offer like that I'll be first in line ... AND I'm local. I will gladly and gratefully take the switch and compensate you with some beer money. Da_Hose wrote: Well hell Alpine, if you make an offer like that I'll be first in line ... AND I'm local. Well then, make it sody pop! Although I have yet to complete the installation, this might be of value to you if you plan to perform this modification. If I had a decent digital camera, you would have seen photos of my progress on the car in 'My Project'. That being said, you will have to imagine what I'm about to attempt to explain to you. I am sure that you are all anxiously waiting for Klearz to finish production of the rear turn signal lenses. In anticipation of this event I am sure that you have all purchased the Xacto 'Razor Saw' that Ivan told you that you would need. This is where we will start. 1. Present the previously obtained illuminated switches that you purchased off of eBay. 2. Produce the Xacto Razor Saw, and find a well lighted work area. 3. Disassemble the switch in its entirety. Disassembly of the switch should be self evident. If you are stumped at this point, perhaps this isn't for you. 4. On the buttons, you will notice a wear pattern from previous use. This is your 'guideline'. Using your brand new razor saw, slowly start to score a groove around the wearline. Once a circumnavigation of the button has been achieved, you can get a little bit more aggressive. Continue until you have removed the top 'hat' of the button. Now do the other one. 5. You are now free to 'rotate' the button hat indicator to the desired position. 6. I used 3M 320 Grit Wet-or-Dry sandpaper to remove the saw marks, and true any inconsistancies created by the UML. Place the paper on a flat, hard surface and draw the pieces across the paper. I rotated the pieces between each stroke to obtain the flattest 'milled' surface that I could. 7. Blow off any dust and apply a VERY small amount of good ol' Superglue to the lower piece's new surface. Apply your button hat in the correct attitude, and hold for a few seconds. Repeat for second button. Go to bed. 8. Good Morning! Now that we are all refreshed, and our glue has had ample time to dry without you screwing up the entire job, let's continue. Using the same piece of sandpaper on the crisp edge of a table, you can remove any excess glue that may have been applied in your intoxicated state last night. Simply follow the same process from a different attitude. 9. If you really happened to use too much glue, you will need to 'break' off the excess glue from the inside of your button with your handy-dandy pocket screwdriver. Don't ask me just how I came about this little tid-bit of knowledge. 10. Reassembly. 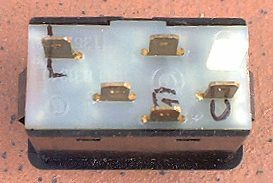 Before you get to antsy, and throw everything back together, take a look at the brass contactors that came out of the buttons. You will notice that they have been used. You can clean the contacts with your sandpaper, but I would like to suggest that you switch the contactors left to right. On well used switches the center contacts like to burn, while the outer contacts appear to be unused. Your call. 11. 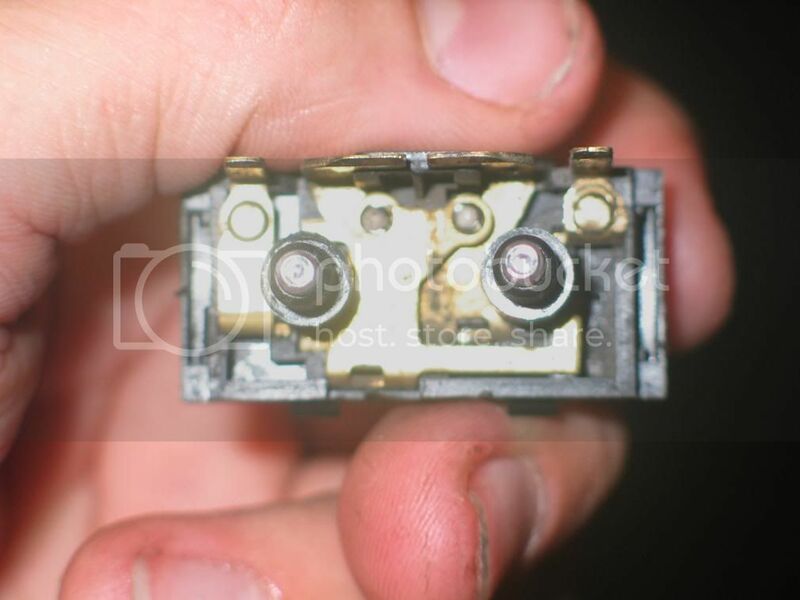 If you look closely at your disassembled switch, you can determine the four terminals that activate the bulbs. It's all DCV, so it shouldn't matter which you use for hot/ground. Mark the terminal lugs with a marker for later use. 12. OK, now you can put the switch back together. Don't you feel better that you have retained the original design and integrity of the switch, yet it now functions as YOU want it to function? 13. Install the switch, and wire into the CLS module. Check to make sure switch functions as desired. Run two conductors down to the existing window switches and tap into headlamp hot, and ground. Last edited by john calhoun on Wed Sep 08, 2010 12:43 am, edited 1 time in total.